The German Adult Education Association (DVV e.V) is the coordinator of VIC. DVV e.V. has more than 900 Adult Education Centres and over 3,000 regional outposts and is the largest Adult Education provider in Germany (close to 17 Million hours of teaching per year). It offers about 600,000 Adult Education offers per year and has around 9 million course participants per year. The DVV has more than 8.000 employees and 192.000 freelance trainers teaching. 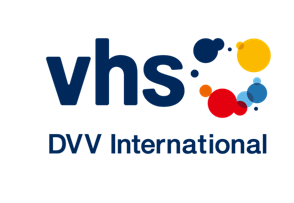 DVV International, the Institute for international cooperation, contributing to the development of adult education systems in 32 countries across the world, is involved in the implementation of VIC. The Institute draws on its expertise as provider of a wide range of projects related to refugees.